Enjoy - Food & Travel: Stav Østre - a new blog!! Stav Østre - a new blog!! Remember the story from Stav Østre? 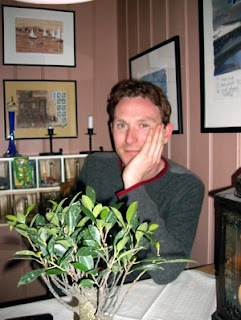 My friends Stian Sagerud (image) and Øyvind Lodten are now fellow bloggers. They share stories to those of you on how to reconstruct an old Norwegian wooden building. They are true handymen and have undertaken a big responsability of preserving a small part of the cultural legacy of Løten, a community close to Mjøsa, the largest Norwegian lake. Good luck, friends! You have achieved much during such a short period. Visit Stian and Øyvinds blog here, and follow the progress of restoring the old house. The food and wine counts - after all! !